Ladybirds might have a reputation as a pretty friendly insect, but they can turn vicious if there’s no food or water to be had. In cases like this, ladybirds can and will bite people, and some species are more likely to do so than others. 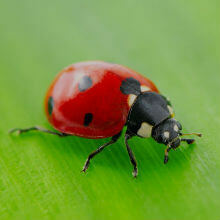 Ladybirds are usually happy to eat insects and are often a pleasant sight for gardeners who are plagued by pests. When times get hard, ladybirds will take extreme measures to survive, including eating other ladybirds and biting people to get some much-needed food or water. Unlike gnats, midges and mosquitos, ladybirds aren’t specialised at feeding on animals and don’t use venom or irritating saliva, so the chances of a bad reaction are low. Ladybirds are used to chowing down on soft insects and can have difficulty breaking through human skin, but there’s always the rare chance that a bite may become infected. In extremely rare cases, people might also have an allergic reaction, so if you experience swelling in areas where you haven’t been bitten, problems breathing or any other serious symptoms - be sure to seek emergency medical attention as soon as possible. Ladybird bites are rarely anything to worry about and you can simply wash them with soap and water to minimise the chances of infection. But if you’re experiencing any worrying symptoms after a bite - speak to one of our doctors online now. They’ll be able to examine the affected area and diagnose whether or not a ladybird bite could be to blame.